The Hoya Con Bio MedLite IV laser machine has long reigned as one of the most powerful Q switched Nd:YAG laser machines on the market. Because of that distinction, the Hoya Con Bio MedLite IV has an unparalleled capability when it comes to removing tattoos, especially stubborn multi-colored tattoos. Because it combines multiple wavelengths and pulse width options in just one cosmetic laser system, the Hoya Con Bio MedLite IV laser machine is really like having multiple cosmetic laser machines in one. Find out how much it would cost to add one of these highly effective cosmetic laser machines to your practice by contacting SunrayLaser.com for Hoya Con Bio MedLite IV pricing information today. Here at SunrayLaser.com, we offer the best prices on used cosmetic laser equipment like the Hoya Con Bio MedLite IV laser machine. When you purchase a refurbished or pre-owned Hoya Con Bio MedLite IV laser machine from SunrayLaser.com, you will know you have gotten the lowest price out there, because we offer a 100% customer satisfaction guarantee along with every single cosmetic laser system that we sell. 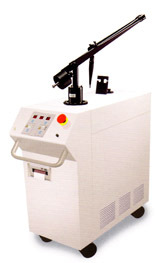 To get a no obligation price quote for a used Hoya Con Bio MedLite IV laser system, contact SunrayLaser.com today. In addition to getting you pricing information without any high pressure sales tactics, our trusted representatives will also answer any questions you have about our used Hoya Con Bio MedLite IV laser equipment.